John Lord continues his travels around Brexit Britain with a road trip to Coventry, UK City of Culture 2021. Having built a singular post-war legacy is the West Midlands city well placed to prosper in its post-European future? Coventry: another Brexit city, another City of Culture, another extraordinary history, another remarkable place. For baby boomers, Coventry means the blitz, dodgy British cars, the new city centre and Basil Spence’s cathedral and, of course, the Specials and 2-Tone music. It’s hard to gauge how a new generation living, working and studying in this notably diverse and youthful city sees Coventry today. But the city is experiencing a recovery of sorts, thanks largely to the presence of two high-performing universities and the revival of advanced manufacturing. The winning City of Culture campaign revealed an exciting cultural scene and a spirit of – sometimes unconventional – enterprise. 2021 promises to be good fun. “Distinctiveness” is a term routinely applied to places that are scarcely places at all, and are certainly not distinctive. In reality, the conventional wisdoms of the property industry are usually indifferent and sometimes actively hostile to any form of local distinctiveness. This presents an interesting challenge for Coventry where the vicissitudes of war and industrial decline, combined with the talents of a remarkable group of post-war architects and planners have produced a legacy which, while undeniably difficult, is one of a kind. That makes it a very important place and a test case for how we deal with our modern heritage. The history is important. Coventry was one of the most important towns in medieval England, its prosperity built on wool and, later, cloth. But centuries of relative decline followed and Coventry was sidelined during the peak years of the industrial revolution. Down the road, Birmingham – “the City of a Thousand Trades” – was booming, while Coventry was making its modest living in watchmaking and ribbon-making. By the end of the 19th century the manufacturing of sewing-machines was a local speciality, swiftly followed by bikes and motor vehicles. The opening of the Daimler factory in 1897 was the signal for an epic period of growth. Between 1901 and 1938, Coventry was the fastest-growing city in Britain: its population increased by 230%, from 70,000 to 230,000, and the city’s boundaries expanded to accommodate sprawling new suburbs. The “Metropolis of Motordom” attracted migrant workers from across the UK and, notably, Ireland. To begin with, vehicle production was accounted for by scores of small businesses producing hand-made cars, but many of these fell by the wayside as ownership was concentrated in fewer hands and the large firms adopted production line methods. Standard Cars produced just 6,000 units in 1930 but output increased to 50,000 by 1939; the story was the same at the other big Coventry firm, Rootes. In 1938 the motor vehicle and bicycle industries accounted for 35% of all employment in the city. These were the childhood years of Coventry boy Philip Larkin. In his 1954 poem “I Remember, I Remember” Larkin recalled the pre-war city “where my childhood was unspent”. The poems reels off a list of things that didn’t happen in those years before concluding that “it’s not the place’s fault…/Nothing, like something, happens anywhere”. In a later (1959) article, the poet recalled a cheerful-enough childhood. But the impression persists that Coventry was a dull and provincial place, rather than a modern industrial city expanding at a breakneck pace. Larkin’s “embarrassing” father, Sydney, was Coventry’s City Treasurer and an enthusiastic supporter of Hitler. Sydney was only persuaded to remove the Nazi souvenirs from his office when war was declared and, according to Andrew Motion, he continued to praise “efficient German administration” even after the air raid of 14-15 November 1940 which destroyed the centre of Coventry. This was the defining moment in the city’s modern history. More than 500 bombers dropped high explosive and incendiary bombs, killing an estimated 580 people and injuring many more, and destroying 4,000 homes. A number of factories were destroyed, but the damage was most severe in the city centre. St Michael’s Cathedral was gutted by fire, almost nothing was left standing in the commercial centre, and the city’s half-timbered medieval buildings were decimated. The fires were still burning and bodies were being recovered when the war artist John Piper arrived the next day. He felt like an intruder, but his painting, Coventry Cathedral 15 November 1940, captures one of the defining images of wartime Britain. Terrible though the raid was, for some the Coventry blitz represented an opportunity. Jeremy and Caroline Gould, in their brilliant history of the rebuilding of Coventry, record that only three weeks later the young city architect, Donald Gibson, told an audience in London that “In one night the site is largely cleared ready for this regeneration”. Attempts to modernise the hopelessly cramped and inefficient city centre had been progressing slowly in the 1930s, but the pace quickened with the appointment of Gibson in January 1939. His plans for a new civic centre close to the cathedral were exhibited at a public exhibition, Coventry of Tomorrow, in May 1940: under these proposals many of the medieval and 18th century buildings that were destroyed a few months later in the blitz would have been demolished. 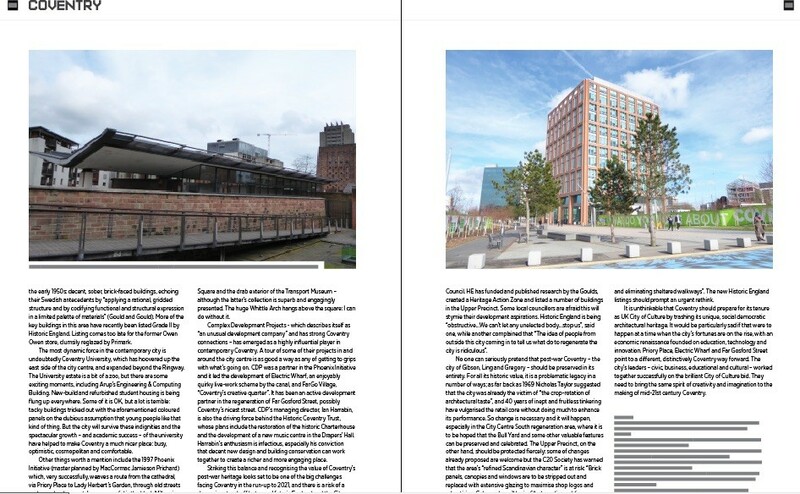 The Goulds set out the chronology of post-war rebuilding, starting with the evolution of Gibson’s plans and the development of Broadgate and the Upper Precinct. From 1955 to 1964 a new city architect, Arthur Ling, oversaw the expansion of the shopping centre, new developments in Corporation Street and the creation of a civic precinct. Later stages of the plan, including Lanchester Polytechnic (now Coventry University), the Bull Yard and a strategy for restoring medieval buildings were supervised by Terence Gregory. The city centre ensemble created by these three is still more or less complete, though knocked about in places. Its future is much less certain. The output of the City Architect’s Department in this period was “prodigious”, including many buildings in the new and expanding suburbs. In the 1969 guide to Coventry New Architecture Nicholas Taylor marvelled at “the sheer quantity of good modern architecture throughout the city” and argued that “…producing such ‘quantity of quality’ is no accident: it was a deliberate political decision, as part of a comprehensive social policy…At Coventry the ideas were those of democratic socialism.” City planning was a top priority for Coventry’s first Labour administration (elected in 1937) and it remained a priority until 1968, when the Conservatives regained control. Post-war Coventry was soon growing rapidly again. British and Irish immigration resumed in 1950s, fuelled by demand for construction workers and labour for the engineering sector. A new wave of South Asian immigration began, leaving a lasting social and cultural legacy. The lives of this community were memorably documented by the photographer, Masterji, who died earlier this year, aged 95. Masterji’s touching and humane portraits have been celebrated in a recent exhibition and a new book. The long boom came to a sudden halt in the early 1970s: recession, a failure to diversify into services and an increasingly uncompetitive automotive industry sent Coventry into a sharp decline; a city renowned for high-wages and low-unemployment became a “Ghost Town” synonymous with joblessness and deprivation. The Centre for Cities suggests that, from the 1990s onwards, Coventry has made a modest recovery and by most measures it is now a middle-ranking English city, but the legacy of the 1970s “still overshadows the region” and influences its reputation. The great symbol of Coventry’s post-war reconstruction is, of course, Basil Spence’s new cathedral, consecrated in 1962. Spence’s design was criticised at the time as both too radical (“this unusually ugly factory”) and – thanks to its “residual Gothic” character - too conservative. Louise Campbell sums up the architect’s dilemma: “Spence became a household name, regarded in the eyes of the public as a glamorous moderniser. By the same token… [he] came to be identified as an establishment figure… Spence’s work for church and government exposed him to the unforgiving gaze of an aggressive avant-garde”. Half a century later much of this debate seems muddle-headed and mean-spirited. Pevsner arrived (in 1966) at a much more balanced judgement. An “entirely uncompromising” building would not have won the competition and would have remained unbuilt, but Spence avoided the risks of a shallow, crowd-pleasing design. Pevsner is not uncritical, but he is generous to the architect and about the building’s “subtleties… [and] high emotive power”. To this layman the cathedral feels like a building of great distinction and, yes, emotional weight. Even in a secular age, the cathedral’s story of reconstruction and reconciliation has lost none of its potency while its value as a work of art has continued to grow. John Piper, who had painted the smoking ruins of the old cathedral in 1940, returned with Patrick Reyntiens to design the overwhelmingly beautiful Baptistery window, there are wonderful furnishings by Elisabeth Frink, and the view along the nave is dominated by Graham Sutherland’s enormous tapestry, with the figure of Christ on a vast field of green. The rest of the Coventry story may be less well known. The best place to arrive is the terrific, listed railway station of 1960-62. An urbane, transparent composition, it is in danger of being subsumed into a woeful-looking scheme for the inevitable “transport hub”. The original building will be grudgingly preserved but the project promoters have signalled their indifference by surrounding it with a jumble of quirky shapes and brightly coloured composite panels – contemporary Coventry’s signature look. Setting out from the train station, we encounter a great recent success. A section of the notorious inner ring road has been dropped and covered to create a new park and a pleasant pedestrian/cycling route to Greyfriars Green and the city centre. The new avenue will form the principal axis of the Friargate development, a long-delayed plan to create a modern business district next to the station. So far only one building has come out of the ground, a handsome 13-story block designed by Allies & Morrison, now occupied by the City Council. The West Midlands Combined Authority (WMCA) plans to invest £90m in the station and Friargate, hoping that the latter will stimulate the moribund office market and provide a much-needed 4-star hotel. Approaching the city centre from the station we enter the retail zone at Bull Yard, a smart little square which was part of the final phase of post-war reconstruction (1963-69). Coventry’s city centre shopping offer has been struggling for many years and the city has slipped to 48th in the Experian retail rankings. Like many second tier cities, Coventry operates in the shadow of a dynamic regional capital (Birmingham), faces competition from out-of-town leisure and retail centres such as Touchwood (Solihull) and cannot match the appeal of smart small towns like Leamington Spa. The precincts seem busy enough but the retail offer is mundane, a mix of mid-market multiples, value retailers and low-rent independents. The food and drink choices are dismal. Predictably enough, higher earning residents take their business elsewhere. 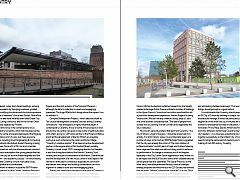 The City Centre South regeneration scheme (again part-funded by the WMCA) is an ambitious attempt to reset the dial. It will sweep away more or less everything south of Gibson’s Upper Precinct to create new shops, restaurants and a cinema complex, although the delightfully chaotic City Market will be retained and, one imagines, tidied up. Continuing north, and travelling in reverse chronological order, we enter Gibson’s two-level Upper Precinct which in turn opens out into Broadgate. The latter was a traffic roundabout for decades but is now a generously proportioned city square, sadly flanked on the east side by the atrocious Cathedral Lanes shopping centre which blocks the view of the cathedral spire. Broadgate and the Upper Precinct were completed in the early 1950s: decent, sober, brick-faced buildings, echoing their Swedish antecedents by “applying a rational, gridded structure and by codifying functional and structural expression in a limited palette of materials” (Gould and Gould). More of the key buildings in this area have recently been listed Grade II by Historic England. Listing comes too late for the former Owen Owen store, clumsily reglazed by Primark. 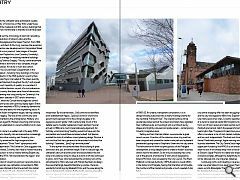 The most dynamic force in the contemporary city is undoubtedly Coventry University, which has hoovered up the east side of the city centre, and expanded beyond the Ringway. The University estate is a bit of a zoo, but there are some exciting moments, including Arup’s Engineering & Computing Building. New-build and refurbished student housing is being flung up everywhere. Some of it is OK, but a lot is terrible: tacky buildings tricked out with the aforementioned coloured panels on the dubious assumption that young people like that kind of thing. 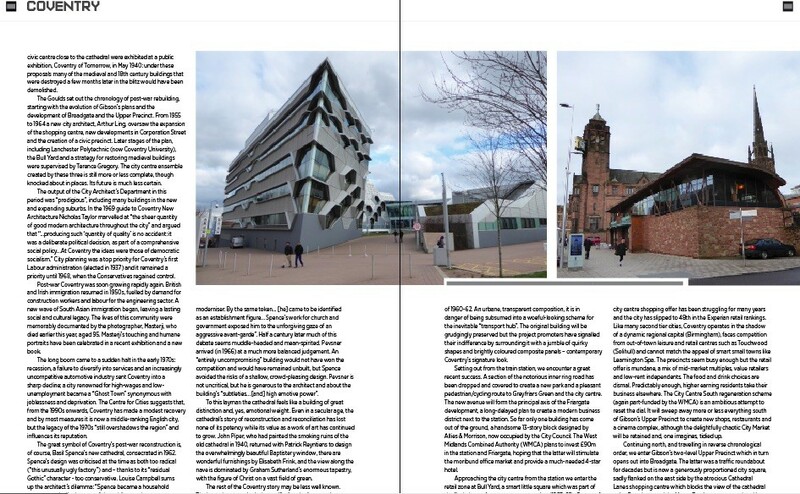 But the city will survive these indignities and the spectacular growth – and academic success – of the university have helped to make Coventry a much nicer place: busy, optimistic, cosmopolitan and comfortable. Other things worth a mention include the 1997 Phoenix Initiative (master planned by MacCormac Jamieson Prichard) which, very successfully, weaves a route from the cathedral, via Priory Place to Lady Herbert’s Garden, through old streets and new development. Less successful is the bleak Millennium Square and the drab exterior of the Transport Museum – although the latter’s collection is superb and engagingly presented. The huge Whittle Arch hangs above the square: I can do without it. 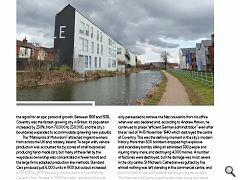 Complex Development Projects - which describes itself as “an unusual development company” and has strong Coventry connections – has emerged as a highly influential player in contemporary Coventry. A tour of some of their projects in and around the city centre is as good a way as any of getting to grips with what’s going on. 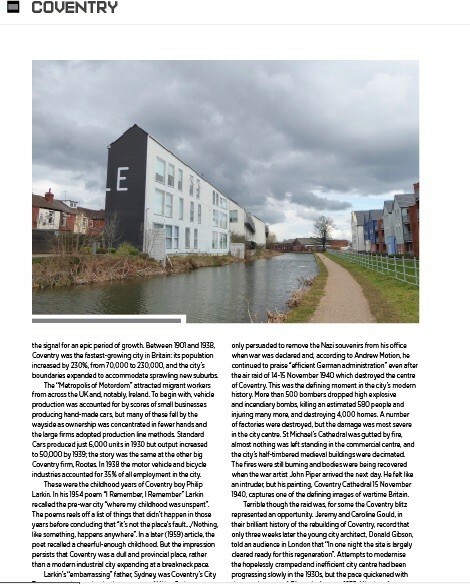 CDP was a partner in the Phoenix Initiative and it led the development of Electric Wharf, an enjoyably quirky live-work scheme by the canal, and FarGo Village, “Coventry’s creative quarter”. It has been an active development partner in the regeneration of Far Gosford Street, possibly Coventry’s nicest street. CDP’s managing director, Ian Harrabin, is also the driving force behind the Historic Coventry Trust, whose plans include the restoration of the historic Charterhouse and the development of a new music centre in the Drapers’ Hall. Harrabin’s enthusiasm is infectious, especially his conviction that decent new design and building conservation can work together to create a richer and more engaging place. Striking this balance and recognising the value of Coventry’s post-war heritage looks set to be one of the big challenges facing Coventry in the run-up to 2021, and there is a risk of a damaging stand-off between Historic England and the City Council. HE has funded and published research by the Goulds, created a Heritage Action Zone and listed a number of buildings in the Upper Precinct. Some local councillors are afraid this will stymie their development aspirations. Historic England is being “obstructive…We can’t let any unelected body…stop us”, said one, while another complained that “The idea of people from outside this city coming in to tell us what do to regenerate the city is ridiculous”. No one can seriously pretend that post-war Coventry – the city of Gibson, Ling and Gregory – should be preserved in its entirety. For all its historic value, it is a problematic legacy in a number of ways; as far back as 1969 Nicholas Taylor suggested that the city was already the victim of “the crop-rotation of architectural taste”, and 40 years of inept and fruitless tinkering have vulgarised the retail core without doing much to enhance its performance. So change is necessary and it will happen, especially in the City Centre South regeneration area, where it is to be hoped that the Bull Yard and some other valuable features can be preserved and celebrated. The Upper Precinct, on the other hand, should be protected fiercely: some of changes already proposed are welcome but the C20 Society has warned that the area’s “refined Scandinavian character” is at risk: “Brick panels, canopies and windows are to be stripped out and replaced with extensive glazing to maximise shop logos and advertising. Colonnades will be in-filled, eroding public space and eliminating sheltered walkways”. The new Historic England listings should prompt an urgent rethink. 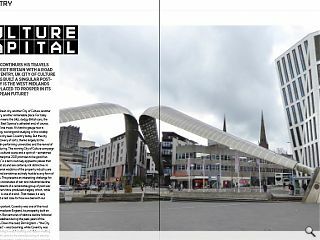 It is unthinkable that Coventry should prepare for its tenure as UK City of Culture by trashing its unique, social democratic architectural heritage. It would be particularly sad if that were to happen at a time when the city’s fortunes are on the rise, with an economic renaissance founded on education, technology and innovation. 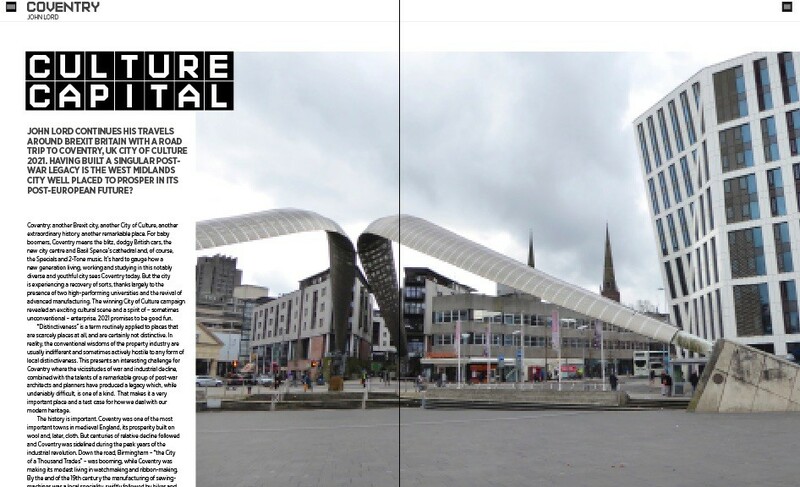 Priory Place, Electric Wharf and Far Gosford Street point to a different, distinctively Coventry way forward. The city’s leaders – civic, business, educational and cultural – worked together successfully on the brilliant City of Culture bid. They need to bring the same spirit of creativity and imagination to the making of mid-21st century Coventry.